The fear factor at Kenilworth Road is starting to come into full effect according to midfielder Luke Berry. 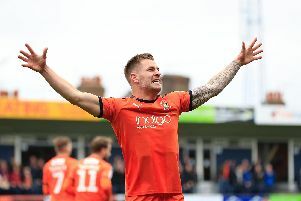 Barring a 3-0 defeat to Swindon, which only came about once captain Scott Cuthbert had been sent off in the first half, Hatters have won six from six, scoring 24 goals and conceding just four, taking 18 points from a possible 18. Last year we struggled a little bit and were strong away from home, this year we’re really, really strong at Kenilworth Road. Berry, who scored a hat-trick during Town’s last home encounter, a 7-1 demolition of Stevenage, said: “I think teams fear us when they come here now and we’re showing that with the results and how many goals we score. “We feel that if we get a nice early goal we can demolish teams and get more and more, and I thought we did that (against Stevenage). “It was free-flowing and we feel like seven wasn’t that generous to us, we could have got more. Luton’s impressive home record will be put to the test when Coventry City are in town this afternoon, with the Sky Blues tough to breach on their travels, shipping a mere six goals from seven games. Skipper Cuthbert can’t wait put his side’s impressive record on the line against one of the biggest clubs at this level, as he added: “Coventry are a massive side. “We always knew they would be up there challenging with the squad that they’ve got, so I’m really looking forward to that. “We’ve transformed our form at Kenilworth Road this year. Last year we struggled a little bit and were strong away from home, this year we’re really, really strong at Kenilworth Road. “The fans have got a massive part to play in that, they get right behind us, and the atmosphere against Stevenage was electric at times.